Associated Press Michigan State's Felton Davis III catches a pass against Utah State's Shaq Bond, right, and Jontrell Rocquemore during the first quarter Friday. EAST LANSING, Mich. – Connor Heyward scored his second touchdown with 2 minutes left to put No. 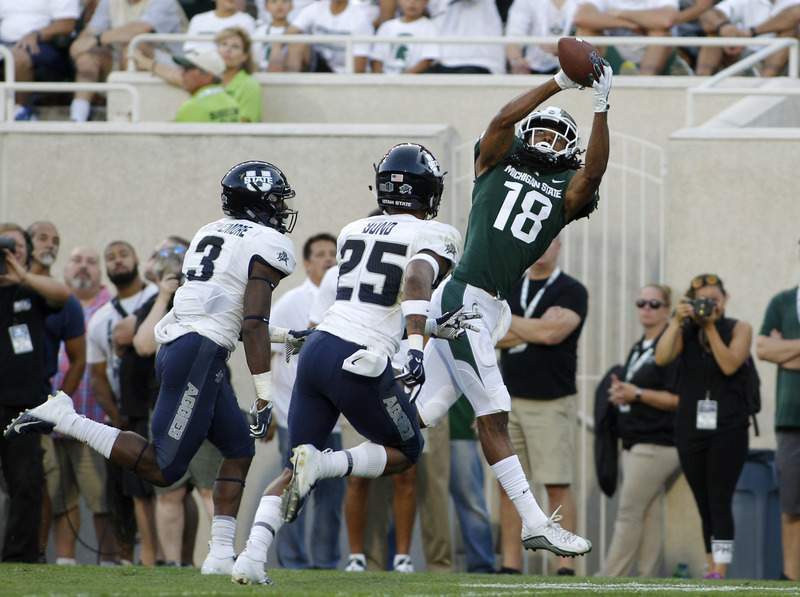 11 Michigan State ahead, and the Spartans held on to beat Utah State 38-31 on Friday night. Darwin Thompson put the Aggies ahead with a 1-yard run, his second go-ahead score of the game, with 5:05 remaining. The Utah State defense couldn't make one more stop to beat the highest-ranked team in school history, surpassing the victory over No. 18 BYU in 2014. Heyward scored on a 13-yard run in the fourth quarter and a 17-yard run in the third. He is the son of the late Craig “Ironhead” Heyward, an NFL running back from 1988 to 1998. The sophomore ran for 436 yards and did not score last season. SYRACUSE 55, WESTERN MICHIGAN 42: In Kalamazoo, Michigan, senior quarterback Eric Dungey rushed for 200 yards and passed for 184, to lead the Orange in the season opener. Wassink threw two touchdowns to D'Wayne Eskridge, including an 84-yard score to make it 34-21 with 7:32 left in the third quarter. Eskridge, a Bluffton graduate, caught eight passes for 248 yards.